It's Show Time in VEGAS! Here I am back in Las Vegas-- and I'm lovin' it! This is my 24th CES and it truly never gets old. Technology impacts our lifestyles now more than ever so it's always exciting to see what's coming next. This show, which runs just four days, is shaping up to be another mega event with more than 180,000 attendees, 11 venues, 24 product categories, 25 marketplaces and 4,500 exhibitors spread out over approximately 2.8 net million square feet. Usually I bring walking shoes, but this is the first time around that I actually packed sneakers so I can try to see as much as possible! Some of the biggest trends for 2019 are voice controlled devices (Hello, Google), the Smart Home and Artificial Intelligence (AI). Read on for all the details on the cool products I checked out! LG SL9YG SOUND BAR -- The stunning look of this soundbar is just one of the many reasons it garnered a CES Innovations Award. It also packs superior sound and smart connectivity. The soundbar supports Dolby Atmos and DTS:X surround sound for an immersive and realistic home theater experience and delivers cutting-edge audio technology through LG's partnership with high-end audio brand, Meridian. Its understated look blends easily in your modern living space and it perfectly complements your TV whether you place this on a console, tabletop or mount it on the wall. It also has Google Assistant built in so you can control your soundbar with a simple voice command as well as other smart devices in your home like smart lightbulbs, thermostats, and door locks. And--it has LG's Artificial Intelligence--LG ThinkQ--for convenient access to LG's other smart home products. LG SUITE OF HOME APPLIANCES -- Whether it's one of LG's refrigerators, electric ovens, washers/dryers or dishwashers, all of these products feature LG's Artificial Intelligence, LG ThinQ. All of these products are capable of deep learning and can communicate with one another making our lives easier and more efficient. Some of the features on these appliances can even be operated remotely, for instance, you can ramp up ice production on your LG InstaView refrigerator or preheat certain LG electric ovens even when you're not home. LG has also partnered with some culinary apps like SideChef, Innit and Drop to guide home chefs in making a variety of meals and automating some parts of the cooking process. For added convenience, the entire LG lineup can be voice controlled with Google Assistant or Amazon Alexa! SCOTTEVEST FIRESIDE FLEECE VEST--Does anyone have enough pockets these days? With all the stuff we carry around with us every day from our wallets and car keys to smartphones and chargers not to mention laptops, pens, water bottles--it can be a bit much. SCOTTeVEST has the solution. They make a line of clothing that has hidden pockets and unique features so you can carry all of your gear and gadgets hands-free--and still look stylish. Their Fireside Vest is a great essential for gadget lovers, frequent fliers, daily commuters or just weekend warriors running around town getting errands done. It gives you an extra layer of warmth without any extra weight plus 15 pockets to stash your stuff. And don't be fooled by the name--SCOTTeVEST makes a lot more than just vests. They have clothing for both men and women--jackets, pants, dresses, hoodies, and even underwear--ALL WITH POCKETS! ANDASEAT KAISER-II GAMING CHAIR-- This is the ultimate chair for gaming, working and chilling! It is an ergonomic dream with high-density cold-cure memory foam, lumbar support, 4D armrests and a cushy comfortable feel! it is the only gaming chair company to offer a lifetime warranty, too! Be a boss in 2019 and take this as your throne! CES FUN FACTS: There have been so many product launches here at CES! The show recently celebrated its 50th birthday and has been running strong since 1967. Everything from the first VHS VCR (way back in 1975) to the first CD players in 1982 to the first Bluetooth-enabled products in 2000 have all made their debuts here. Each year there is an annual competition to honor the outstanding design in engineering in consumer tech products. See below for this year's winners! TECH IS EVERYWHERE: It's not just about TVs! 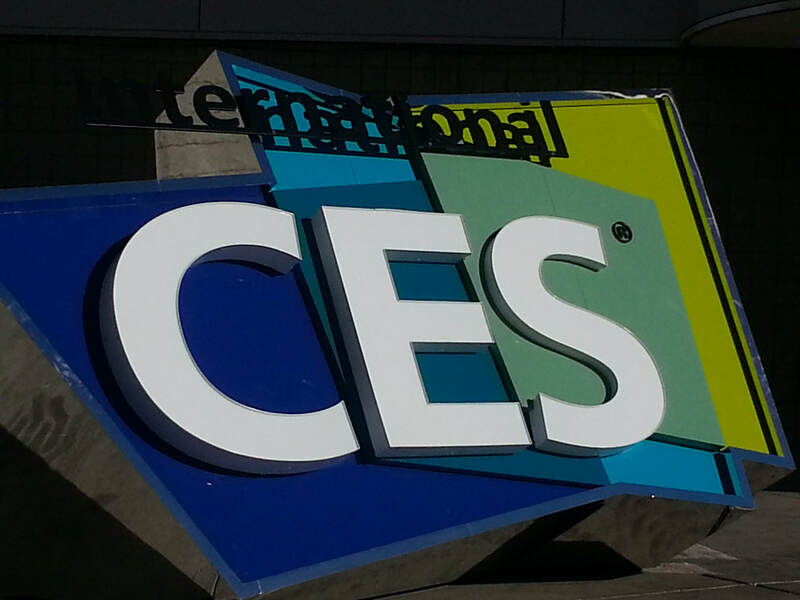 CES is showcasing tech in 24 categories including baby tech, mommy tech, sports tech, sleep tech, smart cities, smart home, vehicles, wearables, wireless tech, drones, robots and more! It is the largest tradeshow in North America--and not open to the public! Each year more than 6,500 media attend.